Yildiz Han is decorated with a traditional Turkish decor; throw rugs, seats, various cultural artifacts and even the staff themselves wear traditional garb. Food is nice and since their main chef is Turkish the food is properly Turkish. 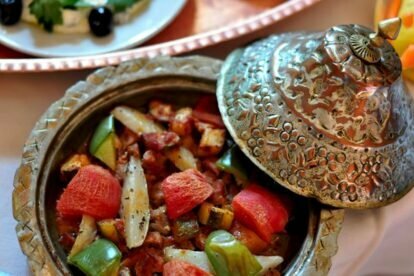 Their offer consist of a lot of meat dishes, but they do offer a nice variety of vegetarian dishes. They sometimes host belly dance performances, sometimes a fortune-teller and from time to time even culinary delights with explanations. This typically takes place in the evening. As it should be, one also has an opportunity to smoke some Narghilé – the famous Turkish pipe. It is not uncommon to smell Turkish-style coffee wafting out of the typical Slovenian home, however in the bars and cafes it is typically espresso that is served. Perhaps this is why Yildiz Han is so loved by locals here in Ljubljana. Here you can get what we call Turkish coffee.